Any roads not being worked on? Are the many orange barrels in and around the Sunbury area giving you the blues or making you see red? Does it seem like Ohio’s state motto is “Road Closed”? We agree, so we thought we’d see what all is going on in the area. Information has been gathered from the Village of Sunbury, the City of Westerville, City of Columbus, Delaware County Engineer’s Office, Franklin County Engineer’s Office, and the Ohio Department of Transportation. Here’s at least some of what’s happening. As residents know, drainage work (Del-Co Water) and utility work (Columbia Gas) was done on Cherry Street and resurfacing was done on State Route 37 at the same time this summer, making for some creative ways to get around the Village Square and Sunbury Plaza. Fortunately, things are winding down. On Sunbury Road, northbound traffic between County Line and Maxtown Roads is now on the newly-paved east side of the road. Southbound Sunbury Road is closed through October. A center turn lane and additional northbound lane is being added, along with a sidewalk on the west side and a multi-use trail on the east side of Sunbury Road. This is a joint project with Westerville and the Delaware County Engineer’s Office and has received a federal grant of $6.2 million. Those who drive on Sunbury Road know that the Smothers Road Bridge opened last month. The project was handled by the Franklin County Engineer’s Office. Other bridge repair projects that were completed is Morse Road over Big Walnut Creek and Alum Creek Drive over Big Walnut Creek. A new roundabout at Lewis Center and Bale Kenyon Roads in Orange Township opened August 11. However, Bale Kenyon Road is closed just south of Bluffs Drive for about 45 days. In September, Bale Kenyon Road will close just north of Bluffs Drive for about 45 days. The Delaware County Engineer’s Office is looking at installing a roundabout at the intersection of Mt. Royal Avenue and South Old 3C, north of the ponds at Orchard Lakes in Genoa Township, a $7 million project. “South Old 3C will be closed to through traffic between Hawksbeard Drive and Mt. Royal Ave. beginning September 2017 with southbound traffic maintained to local residences,” states the county’s Road Construction Guide. Bridge repair at Schrock Road over Alum Creek should be completed Aug. 18. Other bridge projects include: Rohr Road over CSX & NS Railroad, Aug. 14-Sept. 8; Fishinger Road over the Scioto River, Aug. 28-Oct. 16; Trabue Road over a private drive west of U.S. 33, Sept. 1-29; Grandview Avenue over the Scioto River, Oct. 9-Nov. 17. In Westerville, Huber Village Boulevard at South Spring Road should be open again. Traffic in front of City Hall has been shifted to the east side of the road as construction continues in the courtyard. Cleveland Avenue is being widened from Sharon Woods Metro Park to Schrock Road, across from St. Ann’s Hospital. A noise wall would be put in for residents of Barrington Square Apartments. “The current intersection and surrounding roadways have numerous safety and functional deficiencies, as identified in a 2012 Safety Study,” states a project update. 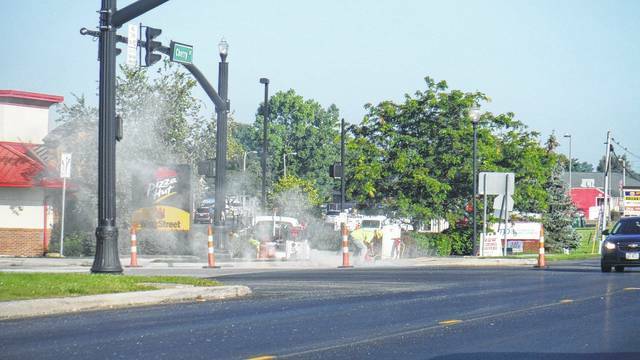 The widening of Central College Road in both directions at Harlem Road to add turn lanes is slated for construction this fall, according to the City of Columbus. Resurfacing Warner Road between Hamilton and Harlem Roads will take place next spring. Construction of a roundabout at the intersection of Orion Place and Olde Worthington Road is also scheduled for 2018, part of a $15.8 million Polaris Parkway improvement project. Improvements to South Old State Road that will widen it to two lanes in each direction from Polaris Parkway to Orange Road is underway, with the $22 million project in Orange Township estimated to finish next June. Phase 2 of upgrading Worthington and Big Walnut Roads in Genoa Township will begin in September. Worthington Road south of Big Walnut, and Big Walnut east of Worthington Road will be closed. In Sunbury, Cherry Street at State Route 37 has been a hub of construction activity this summer.